Big news for Kali Linux users, now you can run Kali Linux in Microsoft Azure cloud and that’s on super fast SSD! It seems Microsoft Azure Marketplace is adding more and more Linux distro including FreeBSD images in their repo. Just to make things better, you can technically run it freely for 1 month if you are willing to cough up your credit card details. Yeah, I know what you are thinking, but this is probably for the White Hats… I’ve added those details at the end of this post. 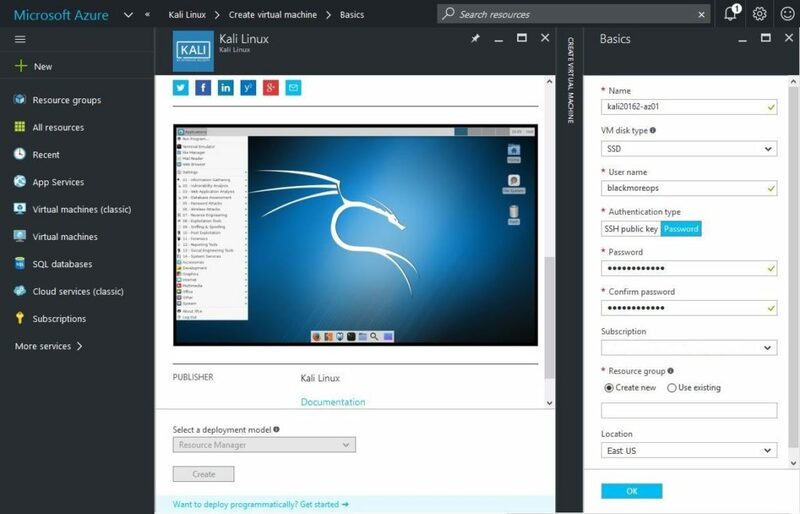 Kali Linux and Offensive Security team has been working on building and implementing Kali 2016.2 in the Azure Marketplace for some time and it seems they have finally done it. Also, as much we say those nasty things about Microsoft, it seems they are more than willing to accommodate Linux users requirements than some other Operating systems. Case in point: Bash shell integration with Windows 10. Either way, you can now spin up a Kali machine from the Azure Marketplace and it takes a few seconds for it to be deployed and you can have a full penetration testing toolset at your fingertips for no additional cost (other than the standard Azure pricing). In fact as I said, if you are a new Azure customer, you can create a free account (or integrate your Hotmail/live account) with it and receive $200 credit. I however recommend reading through Azure Testing Request for T&C before you do something they might not like! @KaliLinux team announced it via Twitter and their website today. Microsoft Azure also updated their website with this announcement. Microsoft Azure actually added some nice description and details regarding Kali Linux. Azure Kali doesn’t allow you to login as root straightaway, so you need to create a standard user (which got sudo access), deploy the VM and then set root password. SSH service runs on standard port 22 but you can use SSH Public Key instead. Credentials: User generated and root password is not set. Microsoft Azure added some basic configuration details (I believe these info were provided by @KaliLinux team). Two things that are important, creating new ssh keys (to avoid the system generated ones) and setting PasswordAuthentication to NO in sshd_config. SSH into your deployed machine with the user account you created during setup. By clicking the Create button, I acknowledge that I am getting this software from Kali Linux and that the legal terms of Kali Linux apply to it. Microsoft does not provide rights for third-party software. Also see the privacy statement from Kali Linux. Depending on what you plan to use Kali for in the cloud, I would say, review these carefully if you are going to invest on cloud penetration environment. Microsoft Azure offers a one-month free trial for any new customer and provide credits of $200 of Azure at no charge. When you sign up, you will receive $200 Azure credits. The choice is now yours on how you use your Azure credits. Use them on any Azure service based on your needs including, Virtual Machines, Websites, Cloud Services, Mobile Services, Storage, SQL Database, Content Delivery Network, HDInsight, Media Services, and many more. AWS doesn’t have kali you dumb cuck. Nice try at being edgy. It sure does, and I’m using one (ami-77f37d04). Please get your facts straight before insulting people. Tomas is correct actually. AWS been supporting Kali minimal (and most Linux distro) since 2014. That’s a good observation. But I think Linux is just too big now to be consumed by anyone. You can use privacy.com to bypass the credit card requirements.